The other day an article in Huffington Post quotes a rural politician from the Midwest, a Democrat who regularly gets elected in a Republican town. He has some comments for his party. “You’re killing us,” he states, “You cannot win elections in 2018 or 2020 until you temper your support of elitists and learn how to talk to the people in what you consider flyover country.” The speaker, who owns guns and opposes abortion, calls on the Democrats to expand their tent beyond the urban elite; the technocrats, the doctors, the lawyers, the journalists, the college graduates. Take this example if you’re from an urban center especially on the coast, where the states are as blue as, say, Texas is red. Do you think your representatives—your members of congress, your governors, your state legislators, can have anything to say to people in the wide open spaces like the Dakotas, Montana, Wyoming? These are not abstract residents of our country. 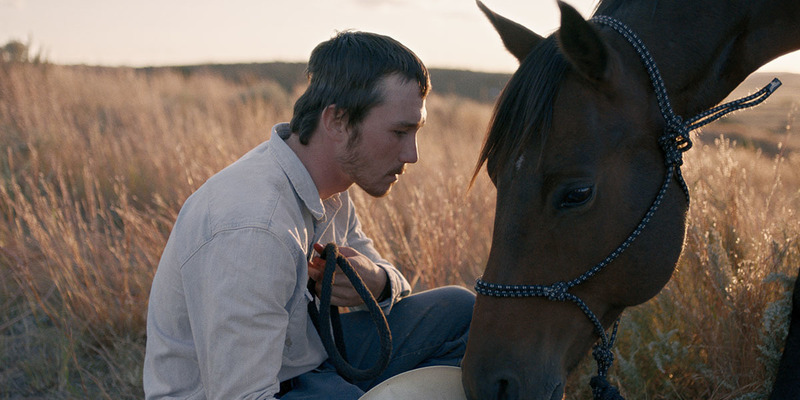 They’re people like the folks in Chloé Zhao’s sophomore feature “The Rider,” the closest picture of Marlboro men we’re likely to get in the movie houses this year. Zhao’s “Songs My Brother Taught Me,” about a brother and sister living in the Pine Ridge reservation who must confront challenges, now directs and writes what she knows. Oglaga Lakota Native American reservation in South Dakota is poor, with only minimal land suitable for farming. For background, viewers should note that the 326 Indian reservations are set aside by the U.S. government to be managed by the U.S. Bureau of Indian Affairs rather than by the states in which they are located. “The Rider” is an unusual film in that it’s a fictionalized version of what the performers actually lived through. The principals are people who were born on the Sioux land. The family in Zhao’s film is dominated by Brady Jandreau, who appears in virtually every frame as the fictionalized version of the cowboy, Brady Blackburn. Brady’s entire life, the only thing he is and ever wanted to be, is that of a horse trainer, a cowboy who does not tend to cattle but makes his living from training other people’s wild horses and participating in rodeos. When he is kicked in the head by a horse he is riding, he has surgery, which puts a metal plate in his head. He is warned to quit his job since one more fall result in his death, but Brady, who has considerable interior action going on within his heavily injured head, insists on continuing what he has always done lest he lose his identity. Brady teen sister Lilly (Lilly Jandreau) has Aspberger’s syndrome which does not hurt her affection for Brady, and Brady’s best friend Lane (Lane Scott) is another casualty of the rodeo circuit, having been paralyzed, using a shaky hand to spell words as he cannot speak. Brady’s father Wayne Blackburn (Tim Landreau) is a rugged individualist with a gambling streak. Brady’s mother is dead and his family is in debt. Otherwise, everything’s fine. Whether you can be absorbed in the plot or not, you can’t help being impressed and educated by watching the action of the bulls in the rodeo yard and, more important, by the wild horses that Brady is paid to train. He is a horse whisperer, meaning that though he ropes the untamed horses by one leg before attempting to ride them, he depends on gaining the animals’ trust. He talks to them, he pets them, he wins them over. It would seem that they would rather have human companionship than revert to their wild ways. In that sense, this is one movie that does not need to employ stunt people to save the necks of the actors. The actors are the stunt people. Chloé Zhao, a Chinese-American up for Independent Spirits awards for movies that cost under $20 million to make, developed the story after hearing about the accident. The film was shot in the Badlands of South Dakota. Once again the big question: can you name an urban Democratic politician who can connect with these cowboys the way Brady connects with his horses? If not, forget about the 2018 Congressional elections. Forget about 2020 as well. Democrats, who under Franklin Delano Roosevelt used to be genuinely for the working classes, have changed. There is a reason that Trump was elected: his win came from the tsunami of rural people, perhaps like Brady, who simply can’t see how the Dems have policies that resonate with them. Who would I have wanted to run against Trump? Joe Biden. With his working class roots and genuine sympathy for the working class, he could have related. You can see videos of Brady Jandreau at work via you tube.